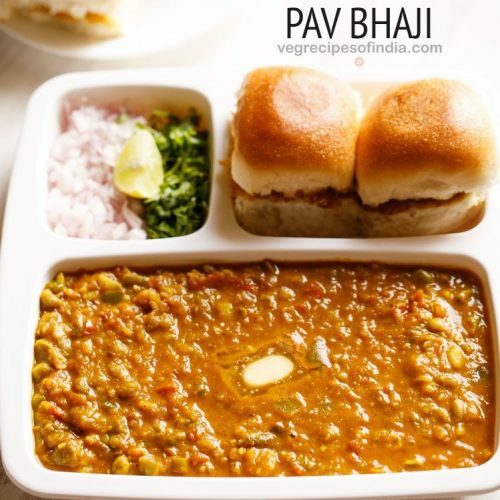 mumbai pav bhaji recipe - pav bhaji is a popular street food from mumbai consisting of spiced smooth mashed mix vegetables, served with lightly toasted buttered bread. 2 teaspoons ginger-garlic paste or 1.5 inch ginger and 5 to 6 medium garlic cloves crushed in a mortar-pestle. rinse, peel and chop the veggies. you will need 1 cup chopped cauliflower, 1 cup chopped carrot, 3 medium sized potatoes (chopped) and ⅓ cup chopped french beans. you can also add veggies of your choice. add all the above chopped veggies in a 2 litre pressure cooker. also add 1 cup green peas (fresh or frozen). add 2.25 to 2.5 cups water. pressure cook the veggies for 5 to 6 whistles or for about 12 minutes on medium flame. when the pressure settles down on its own, open the cooker and check if the veggies are cooked well. you can even steam or cook the veggies in a pan. the vegetables have be to cooked completely. heat a pan or kadai. you can also use a large tawa. add 2 to 3 tablespoons butter. you can use amul butter or any brand of butter. butter can be salted or unsalted. as soon as the butter melts, add 1 teaspoon cumin seeds. let the cumin seeds crackle and change their color. then add ½ cup finely chopped onions. mix onions with the butter and saute on a low to medium flame till the onions translucent. then add 2 teaspoons ginger-garlic paste. you can also crush 1.5 inch ginger and 5 to 6 medium garlic cloves in a mortar-pestle. mix and saute till the raw aroma of both ginger and garlic goes away. then add chopped green chilies. mix well. now add 2 cups finely chopped tomatoes. mix very well. saute till the tomatoes become soft and mushy and you see butter releasing from the sides. this takes about 6 to 7 minutes on a low to medium flame. if the tomatoes start sticking to the pan, then sprinkle some water and mix well. when the tomatoes have softened, then add ½ cup finely chopped capsicum (green bell pepper). sauté for 2 to 3 minutes. if the mixture starts sticking to the pan, then you can sprinkle some water. you don’t need to cook the capsicum till very soft. a little crunch is alright. add 1 teaspoon turmeric powder and 1 teaspoon kashmiri red chilli powder. then add 2 to 3 tablespoons pav bhaji masala. mix very well. add the cooked veggies. add all of the stock or water from the pressure cooker in which the veggies were cooked. mix very well. then season with salt as per taste. with a potato masher, begin to mash the veggies directly in the pan. you can mash the veggies less or more according to the consistency you want. for a smooth mixture mash more. for a chunky pav bhaji, mash less. keep on stirring occasionally and let the bhaji simmer for 8 to 10 minutes. if the bhaji becomes dry and then add some more water. the consistency is neither very thick nor thin. do stir often so that the bhaji does not stick to the pan. when the pav bhaji simmers to the desired consistency, check the taste. add salt, pav bhaji masala, red chili powder or butter if required. when the bhaji is simmering, you can fry the pav so that you serve the pav with hot bhaji. slice the pavs. heat a tawa or a shallow frying pan. keep the flame to a low and then add butter. when the butter begins to melt, add a bit of pav bhaji masala. you can skip pav bhaji masala if you want. mix the pav bhaji masala very well with a spoon or spatula. then place the pav on the butter. rotate the pav all over the melted butter so that the pav absorbs the butter. now turn over the pav and rotate them on the tawa so that the second side absorbs the butter. add more butter if required. you can turn over and toast them more if required. then remove in a plate and keep aside. now take the bhaji in a serving plate or a bowl. top it up with one to two cubes of butter. you can add more butter, if you like. place a side of finely chopped onions, lemon wedges and finely chopped coriander leaves. or you can sprinkle onions, coriander leaves and lemon juice directly on the bhaji. serve bhaji with the lightly pan fried and buttered pav. pav bhaji is topped with chopped onions, coriander leaves and the lime or lemon juice is squeezed on the bhaji while eating. the spice powders can be easily adjusted to suit your taste. if you don't want to add butter, then you can also make the pav bhaji in oil. if you don't have pav bhaji masala, then add garam masala. i have made pav bhaji with garam masala only and nobody could tell the difference. in this scenario, then just add some dry mango powder/amchur to the pav bhaji to get that slightly sour taste. quantity is 2 tsp garam masala with 1 tsp amchur (dry mango powder). pav bhaji can be had as a meal during lunch or dinner. you could also have it as an evening snack. use good quality pav bhaji masala or make it at home.